The Old Copper Mine in Bristol Connecticut has long been regarded as one of the world’s premier localities for chalcocite crystals. Living only a few miles away, I have always been intrigued by the occurrence. The mine was one of the first mineral localities I visited back in 1968. At the time, I was able to find only a few small quartz crystals in the very limited dumps, and virtually nothing remains now. Still, it has always been a fascinating locality for me. Perhaps the best account was written by Robert W. Jones for the Mineralogical Record in the November/December 2001 issue, which is still available from the Mineralogical Record (you can order it online at MineralogicalRecord.com ). I would heartily encourage anyone interested in the history of the Bristol Copper Mine to read this article. It covers the locality in tremendous detail. Dr. Wendell Wilson photographed the 4.1 cm chalcocite group illustrated here. This particular chalcocite is the best I ever owned. It came out of the Ferrier collection and I acquired it from Dr. Don Doell in exchange for a Chinese cinnabar with metacinnabar. Perhaps the most interesting feature of this chalcocite is its great luster. When I first acquired it, it had more than a century’s worth of sooty accumulation on it, which is quite typical of these chalcocites. This soot is thought to be the result of bacterial action on the chalcocite, and in most cases, it is not possible to make significant progress in cleaning off the soot. This particular specimen cleaned up remarkably well by being washed in Alconox. Alconox is a special detergent used in the cleaning of laboratory glass. Only a small percentage of chalcocites respond to Alconox in this way, but when they do, the transformation is beyond belief. Over the next few years, I sold this specimen to Dr. Bruce Jarnot, then reacquired it, sold it to Marilyn Dodge, reacquired it once more, and traded it to Stuart Wilensky. It is amazing how many times a specimen such as this may change hands in a very short time. The last I heard it was with Irv Brown. I would really like to know who else may have owned it in recent years. The most remarkable chalcocite specimen I have ever seen is a 3 by 1.5 inch arrowhead-shaped twinned crystal on matrix, which is currently in a Pennsylvanian collection. It is by far the largest known crystal of Bristol chalcocite and the finest specimen I have seen from the mine. Harvard University certainly has some choice Bristol chalcocites as well and also has perhaps the best Bristol bornite. There were other localities in Connecticut which produced chalcocite crystals. One in particular fascinates me. It was reported that in colonial Connecticut, large chalcocite crystals were found near Wolcottville. A few crystals were supposedly saved in a collection put together by Charles U. Shepard (1804-1886). These specimens were perhaps stored in Hartford, but I have never been able to discover what happened to them. 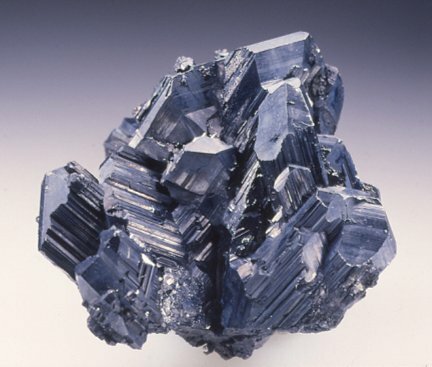 One load of chalcocite was said to have been shipped to England (probably to the famous smelter at Swansea, Wales), and the ship was lost at sea. One has to wonder if great specimens are at the bottom of the Atlantic.